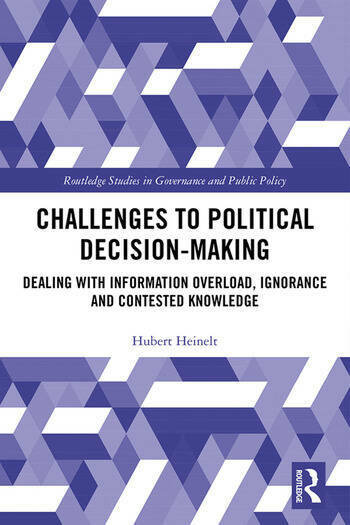 This book analyses the ability of individuals to create meaning through communicative interaction and of what seems to constrain and enable actors in taking collectively binding political decisions. The book examines why, in some contexts, individuals consider something as evident and relevant for their action whilst others perceive them as nonsense or simply as ‘fake news’. As such, the book follows a research perspective based on a concept emphasizing that the core function of knowledge is related to the selection and integration of data and other information which give them substance. Taking an interpretive political science perspective to knowledge, the book overcomes particular deficiencies of policy learning concepts where the development of an understanding of ‘reality’ is thematised in a way that supposedly decrypts everyday processes through which individuals understand ‘reality’ and (re)orient their actions to intersubjective processes. To better understand these intersubjective processes, communicative mechanisms are worked through where knowledge claims are selected and integrated. This book will be of key interest to scholars and students of political science and policy analysis and more broadly, to sociology and social theory, geography, planning, philosophy, communication studies, and governance studies. Hubert Heinelt is Professor of Political Science at the Technische Universität Darmstadt, Germany, and Advisory Professor at the Tongji University, Shanghai.